This tour concentrates on the historical riches of Mongolia, which are delightfully set against a backdrop of awesome natural splendor. Tour in Ulaanbaatar, including the Gandan monastery and the Natural History Museum. Visit the Hustain Nuruu Reserve, where the last remaining species of wild horse is being reintroduced into the wild by a Dutch organization. Stay in gers that perch on the banks of the pristine Lake Hovsgol. 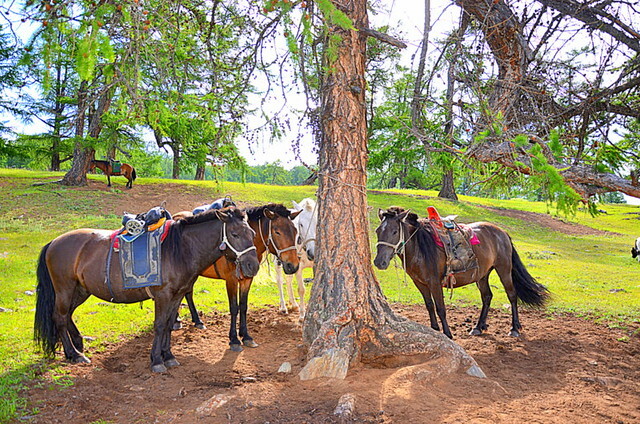 Ride horses, visit nearby nomadic communities, or fish in the clear water. Embark on a private tour to the Karakorum region in Mongolia; explore the beautiful lakes and mountains via a private jeep and driver. Upon arrival at Chinggis Khan International Airport, you are met by tour guide and transferred to the hotel in the city center. The first stop is at Sukhbaatar Square, which is the central square named after the revolutionary hero of 1921 Damdiny Sukhbaatar whom declared independence from China. You will visit the Gandan Monastery that is the largest and most famous functioning monastery in Mongolia; here you may experience the monks in worship and see the impressive Golden Buddha Statue of Migjid Janraisig. Drive to flaming cliffs known as Flaming Cliffs is located 20 kilometers away from Bulgan soum, a lot of Paleontological findings have been discovered here. The place is known as 'Flaming Cliffs' was named by Roy Chapman Andrews, an American explorer who had visited Mongolia in 1922. Today we will drive to Khongorinn Els sand dunes, the largest sand dunes in Mongolia. These dunes lie in the Gobi Gurvan Saikhan National Park. The drive is through some incredible desert scenery with flat, stony plains; outcrops of vegetation; hills of interesting rock formations; and herds of wild antelope racing across the plains. The roads are flat and fairly even so it will take at least 4 hours. The shifting sand blown by the wind or someone makes sound so it is called Singing Sand Dunes. After the rest, we will visit a herder family nearby. We will spend some time there getting to know the family members and their casual yet unique daily lifestyle. It is a good chance to see how the family members cooperate together to do their daily even hourly chores such as milking mares, fencing and milking the goats. If you wish, you arewelcome to try some mare's fermented milk and other dairy products. Following an early morning breakfast, we are transferred to the Dalanzadgad Airport. 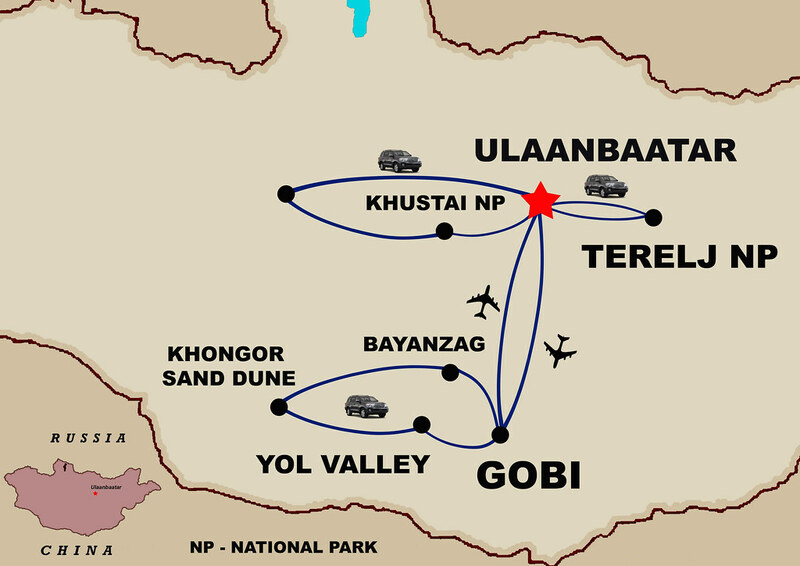 We bid farewell to our drivers and fly to Ulaanbaatar where we meet our local transport and then we are transferred to Gorkhi Terelj National Park. Upon arrival at the airport, meet your driver and you are transferred to Gorkhi-Terelj National Park. On the way, you will take a detour to visit the giant Statue of Chinggis Khan which stands 40m (132 ft) high. We will drive to Hustai National Park Hustai National Park is the site of a unique re-introduction scheme of Przewalskii’s horse (Equus przewalskii), called "takhi" by Mongolians. It became extinct in the wild in 1969 and, since 1992, has been successfully re-introduced to Hustai from zoos around the world. Ancient capital of Mongolia Karakorum city was located on the right bank of Orkhon River and on the north-eastern slopes of the Khangai Mountain and founded by Chinggis khan in 1220, was not only the capital of the vast Mongolian Empire but the epicentre of trade along the Silk Road.